Any idea what the smallest species of Armadillo is? You guessed it! It is the tiny (only 3 or 4 inches long), and ever so cute, Pink Fairy Armadillo (Chlamyphorus truncatus)! This little resident of a small area of central Argentina is found in sandy desert areas where it lives by digging under ground with the huge claws in has on its front and rear feet. It digs in search of ants (its primary food source), worms and other subterranean invertebrates that it feeds on. 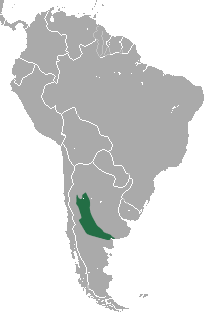 Geographic range of the Pink Fairy Armadillo. Those huge claws are actually so big that these armadillos can have trouble walking on firm surfaces. The advantages of having such impressive hardware becomes obvious when the creature digs. They can burrow so fast through the sand that they are sometimes referred to as ‘sand swimmers’ by native peoples of the area. Pink Fairy Armadillos spend the vast majority of their lives creating and moving through these underground tunnels where they generally live as solitary individuals or, sometimes, in pairs. Along with their underground lifestyle come several predicable adaptations common to organisms that have evolved to live in dark habitats. These include highly reduced eyes, but exceptional senses of touch and hearing. 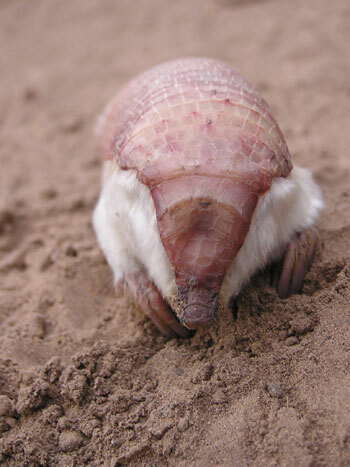 Pink Fairy Armadillo at the entrance to its burrow. Their subterranean life also makes these animals particularly sensitive to the effects of climate change. As soil temperatures change the ability of these small armadillos, which are able to store very little body fat, to thermoregulate and metabolize nutrients may be greatly effected. Another threat from climate change has to do with rainfall. 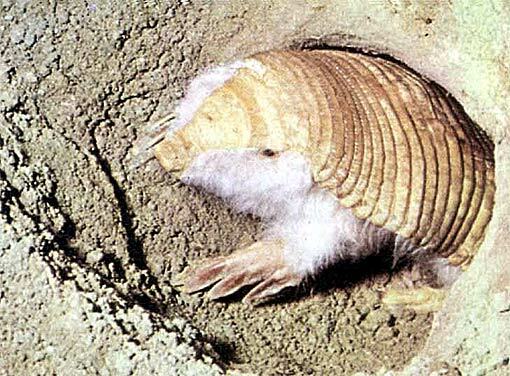 When significant rains occur, the Pink Fairy Armadillos is forced to leave its burrow or else drown and the burrow fills with water. Once it is in the open, it is much more likely to get wet, and therefore cold, and therefore die of hypothermia due to a lack of insulation (again, no body fat). Further, when on the surface, Pink Fairy Armadillos are at risk of predation since they cannot escape by burrowing back underground. Two of the primary predators of Pink Fairy Armadillos are domestic dogs and cats. Wild boars are also a significant threat. One common effect of climate change is in altering the rainfall patterns of many areas, so an overall increase in predation risk is a very real possibility for this species. These risks are also combined with several more. One is habitat destruction due to conversion of open land to farming which not only plows over burrows, but more importantly, changes the soil away from the sandy constancy needed by this species. Yet another problem for these animals is hunting for food, and trapping for the pet trade. 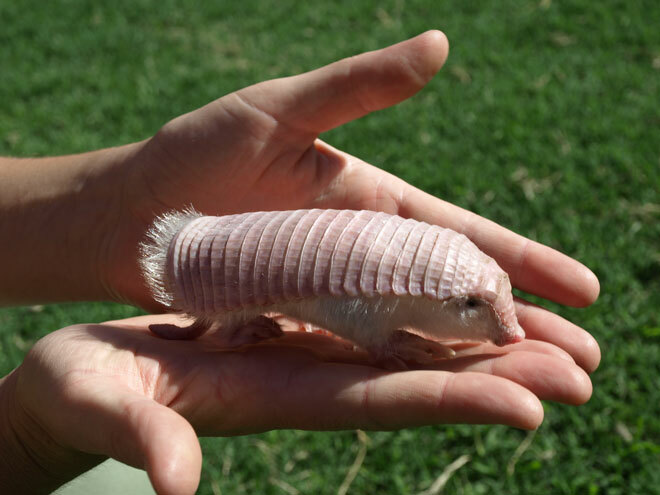 It is illegal to keep Pink Fairy Armadillos as pets, however, they are so small and cute that a demand does exist, and a black market continues to meet that demand. This is especially bad because these animals are very sensitive to capture and die, often times in just a matter of hours, in captivity. This makes a couple of standard conservation strategies impossible. One classic is to start a captive breeding program of a species of interest in the hopes of being able to raise many individuals for release into the wild. Obviously this will not work of all the animals brought into captivity die immediately. Another common conservation strategy is relocation. If a population is in imminent danger (say from the expansion of farm lands), a bunch of animals can be captured, transported to a safe location with proper habitat, and released there to go about their business. Again, if the animals die during the journey, this strategy is not going to work out. 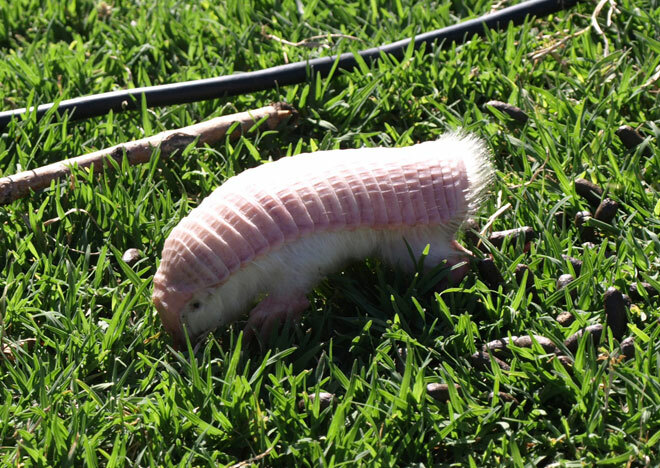 Fortunately, there are a number of Pink Fairy Armadillos that live in existing protected areas and legislation in the works in Argentina to expand these areas specifically to protect Pink Fairy Armadillo populations. Hopefully, this will be enough to give these neat little critters the space and sand they need to swim into the future.